Piano fingers. 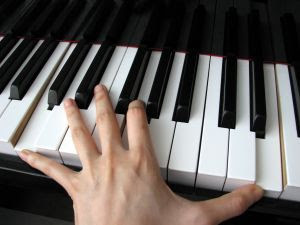 Yeah, that's what everyone said I possessed...long, slender fingers that could stretch across the keys. My Mom had the same type of hands, so my parents purchased a handsome spinet. In spite of having piano fingers, I didn't have a piano heart. Practice time ranked right up there with going to the dentist. Much to my relief, a year-long struggle with music theory and piano finally came to an end. My repertoire consists of a showy arpeggio and a kiddie song that escapes me at the moment. Writing is more than knowing what verb to use, whether you should use 's or s', or knowing how to self-edit. Creative writing is about vision and passion. It's about a message burning in your heart. One author I know has a desire to present relationships from a Christian perspective. Another writes books based on themes of forgiveness, love, and kindness. Others write non-fiction, helping people survive grief and loss. The common denominator for all of them is a heart for God and people. When rejections pile up, and I get sent back to re-write for what seems like the millionth time, my commitment to the vision keeps me on course. What keeps the writing fires burning in your life? It's been my dream all my life. Sometimes I still have doubts as to my ability. It comes from a serious lack of self-esteem... But then I read my ms, and it's good! The characters are real to me. I'm driven to see if they are real to others. Passion! Passion for writing. Getting published, winning contests, etc. is just the icing on the cake! And I do crave icing!! LOL! It's much like for me. That commitment to vision and this passion for the written word is what brings me back; this desire to share with others and make them feel something. LOL! I see I forgot to title this post. I think every writer goes through those periods of doubt. We're so aware of all we still need to learn. Great point! If writing is viewed as just another job, the reader will sense it. What's that quote we often hear? "No tears in the writer. No tears in the reader." LOL! I liked the IDEA of playing the piano, but it wasn't a heart desire. One of the O.T. prophets expressed his need to give God's Word as "a fire in his bones." I think that about sums it up. Icing is good. It's that finishing touch that makes the cake even more attractive and tasty. What a great post for a Monday. Writing isn't for everyone, just as piano playing isn't. I think it's amazing that God has giving us all unique gifts and our hearts can leap with passion and joy for those particular tasks. I have enjoyed writing most of my life. But it wasn't until after I became a Christian that I really had a passion for sharing my words with others. For reaching people with my writing and making a difference. It makes writing that much more enjoyable and important to me. Excellent point (and maybe another blog post). LOL! More than one factor goes into dynamic writing. Thanks for bringing up the trigger for your writing. Life experience can certainly prompt passion. I went back in and titled the post! Thanks for the post, Susan! It's encouraging to be reminded of such things. What keeps me going - I guess I just know inside that writing is my thing, and since God created me, it came from Him:) And if it came from Him, then He's given me the tools, and despite ups and downs, He will cause me to succeed. What keeps me writing is the fact that my mind keeps active and I want to share some of those ideas with others. It gives me joy. Spreading God's word and writing a story that is captivating and oh so hard to put down. Sharing with others is a common theme we're seeing. Knowing you're helping someone else gives much joy. These are huge motivators for me as well. When I can't put a book down, it inspires me to reach that level in my own writing. Thanks for bringing up an important point. Knowing God gave us a gift to write is a stabilizer in hard times. The basic equipment is there, as well as His blessing. Perfect analogy, Susan. It's so much more than technique or even talent. It's heart and drive. I'm humbled by your kind words. It's only by God's grace that others are encouraged. I can relate to this one. I'm not a piano gal, although I took years of lessons. I could have become proficient, but my heart wasn't in it. My heart is in writing, and that's what keeps me at it! LOL! I'm glad I didn't have to suffer for years. I took piano in grades 4,5,and 6. In the sixth grade I was sick with the Flu four times. I really didn't like to practice. So, my dad was laid of from or on strike against his job. I didn't get to continue. What keeps me writing? I recently recieved feedback about the newsletters I do. I have gotten positive response to a special poem I give to parents who have lost a child. My plays are received well by those who attend them. But, mainly God keeps me at it. We all need affirmation and support. Knowing that someone's life has been impacted by our writing helps us press on in difficult times. Fire in the bones... those times when I begin furiously clicking away at the keyboard - when I'm focused and tuned in and distractions are directed into the peripheral regions of my consciousness... Yeah, that's my kind of writing. Like you, I had piano fingers, but not a passion for playing. I lasted about as long as you did. When I write, I'm not thinking of publishing. That's what keeps me going. If I write only to please an editor or a specific audience, my passion to write dwindles. I write, first and foremost, for the enjoyment of writing. Then, when all the words are on the paper, I think about whether I want to share what I've written. If I do, that's when the writer's passion blends with the writer's work. I know what you mean. While it's hard for me to sit down and write, once I get "in the zone," the hours fly by. So many of us are geared toward writing for a publisher or audience that we forget how to enjoy ourselves. What keeps my fire burning? The desire to see something I've written change a life. Three years? I'm glad I didn't have to take lessons that long! Touching another person's life is a great reason for writing. We're so connected with others - more than we realize. Years ago, there was a song about being His hand extended, reaching out to the oppressed. I also want to be His hand extended to others. I come from a musical family--my father is a career musician and my brother play various instruments--but for some reason I didn't inherit the love of music like them. Like you, Susan, writing is my passion. My desire to be a great writer and earn a living doing what I love fuels me to keep trying and not give up. I keep telling myself one day I'll get there if I faint not. Thanks for bringing up another great point. Passion is fueled by doing what you love. I know some people, who chose their careers based on earnings potential alone. They were miserable.